At PCI, we insure current and former coaches and athletes from the NFL, MLB, NBA, NHL, NCAA and PGA. Therefore, we fully understand the importance of knowing the schedules and habits inherent within each of these groups, to be able to truly serve as a resource. Every player and coach yearns for long-term security and our process helps to provide that for them. It is this understanding and knowledge that allows us to provide the maximum protection and ease of doing business. We accomplish this by taking a 3-step approach to managing the relationship for the long-term. The first step is analyzing their existing situation, including loss history, how long they have been in the league, and family situation. There are several insurance companies that will not offer coverage for players that are either too new to the league or too high-profile. But by having a good relationship with carriers, and understanding the type of client they are looking for, we are able to uniquely determine who provides the best insurance company fit for a particular client. And just to make sure our clients understand how the process works, we counsel them on the different types of insurance being offered, as well as the importance of being properly insured. One of the major areas where athletes can reduce their premiums is by taking higher deductibles. We provide a cost breakdown and are able to provide our clients with the financial data to make the decision of which option to choose one that is based on pure financial data and is not just a guess at what the best option is. The second step is preparing our clients on how to work with carriers that specialize in working with the unique needs inherent when insuring high net-worth individuals. We make sure that our clients are aware of billing procedures, in order to ensure that policies do not get canceled and that all payments are made on time. Many insurance companies use an insurance score to determine if they will provide coverage and what their rate will be. The insurance score takes into consideration credit history and payment history on insurance policies. Many professional athletes pay cash for most of their purchases, so they don’t typically have high credit scores, which makes it even more important that their insurance policies are paid on time. We also closely monitor claims activity and consult with our clients prior to filing any claims. Having a poor claims history will impact premiums for 3-5 years and limit the options available should the need arise to move to other carriers. The third step is to transition the client into one of the “high net-worth” carriers (AIG, Chubb, PURE etc…). These carriers are familiar with coverage needed for high-value homes, expensive vehicles and other valuable articles. They are also in a position to regularly offer higher liability limits than standard carriers. These carriers understand the unique needs of high net worth individuals and are able to provide more flexibility by custom-tailoring coverage to clients to ensure they are spending their money on coverage that they need instead of just having standard percentages apply, which often results in clients being over insured. In addition, either an interior or exterior home inspection is performed on all new risks. These inspections are done to ensure that clients have their homes adequately insured and to look for items that may increase the potential for loss. By looking for possible hazards, many potential claims can be prevented before they occur, which saves these clients from future premium increases, payments for deductibles etc.… When there is a claim, we are there to assist our clients and keep them informed as the process unfolds. We also apply any necessary pressure on the carrier to ensure that the claim is taken care of to the client’s satisfaction. These high net-worth carriers pride themselves on how they handle claims for their clients and therefore most claims are processed without a hitch. Unfortunately, you can’t choose when a claim will occur, but be assured they usually happen at the worst time. When necessary, we will attend the claims inspection, particularly if a player needs us to be there because they have a game-day scheduling conflict. Sometimes they just need us to work with the adjustors on their behalf. 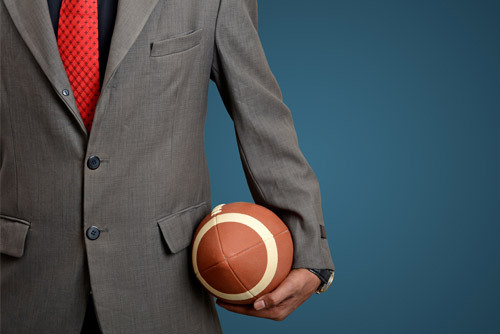 Many athletes transition into business owners once they are out of the league and we can provide them with the necessary business insurance to help ensure the assets they acquired while playing will not be at jeopardy. We work hand in hand with our clients’ trusted advisors to help manage their relationship and keep up with their constantly changing situation. We work with financial planners, sports agents, business managers and other “influencers” in order to ensure that our clients are protected in all of their endeavors. For example, an advisor may be aware of something that needs to be brought to our attention without the client having to make an additional phone call. We work extensively with the athlete’s significant other and make sure they are part of the process by making ourselves available should they have any insurance questions or needs. The key for us in working with professional athletes is making sure that we provide them with the convenience and expertise that they require. Every year we conduct follow up conversations with our clients to ensure that we stay ahead of their insurance needs. We have the ability to insure their assets no matter what state or country they are located in. We also make sure all our clients can reach us whenever is convenient for them by giving them the cell phone numbers of the president and owner of the agency and encourage them to call, email or text us whenever the needs arise.